Invasion! This was DC’s big crossover event for 1988 with cross overs into 30 other DC comics and featuring guest appearances from other DC Universe staples. 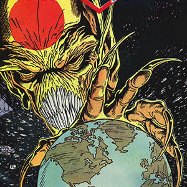 These books were plotted by Keith Giffen, and ties up a great many plotlines from the various Giffen-created DC series, including Omega Men, Justice League International, and Legion of Super-Heroes.